At some point in the fabric selection process we have all been there. After going through our stash with a purpose (which is no easy task given the enormity of the amount) and sending most of the rejects to the floor in one massive pile to sit there for extended periods of time none of us will admit to, we give up and compromise. We have failed to find just the right fabric to pull off an applique detail just how we envisioned it. After all, you can’t mix fabric like paint to come up with the perfect color right? “Hmmm, what do I do next?”, we stand there asking ourselves in total frustration. You do not have to compromise so let me enlighten you to a trick that has been around for for awhile and yet never really taught or discussed until recently when it became uber trendy to use art materials on our quilts. I can feel your excitement building right? You can enhance areas of your applique where the fabric just didn’t seem to have enough oomph (another technical term) by adding some touches of highlight and shadow with small (the use of the adjective small here is very important–restrain yourself and don’t go nuts I am begging you) touches of colored pencil to turn the “only fabric I had close enough” to the perfect fabric. Oh and you can still remain a traditional quilter in the process which is very important to me at least. The key to using colored pencils properly is to use the dull side so you do not apply harsh lines that are difficult to remove and blend. For once, do not use a sharp pencil! Layer your color. Don’t add the whole tube of lipstick all at once. Start with a very soft transparent layer, blend gently with the cotton swab, continue to layer color until the right intensity of color is achieved. Ok, now you are ready to make this permanent, and I mean washing machine permanent so make sure you like your results. Yes, Fellow Quilter, You can Make Colored Pencils Permanent! I was told after many an inquiry that all you need to do now is to iron the area with a really hot iron and voila! permanent. Hmmmm, not so much. Nothing like doing a lot of color layering work to perfection and then washing only to see a shadow of the color left behind. Everyone say it with me here…”grrrrrrrrrrrrrr”. Ok so maybe I used a stronger word(s), but you get my general drift. So I experimented, a lot! and found a solution that REALLY works. Aren’t you really excited now??? Take the colorless extender and your paintbrush out of your toolbox. 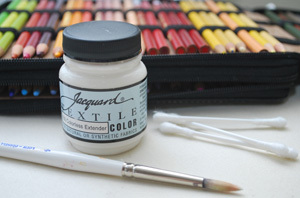 Now you do not need very much of this extender, just a little bit on the tip of your brush and with a feather touch, and barely touching the surface of the fabric, leave a thin (really thin) layer of the extender over the colored pencil area. Once the area is covered with a thin layer, let it air dry. Once the area is dry then heat set with a dry iron for approximately 5 seconds. That’s it! If you washed it on your strongest machine cycle, the color would stay exactly like it was before you washed it. It really is permanent! Remember, you are accentuating the applique not overwhelming it. Does the colorless extender stiffen the fabric? I want to color my fabric to make quilt blocks. No Kim, as long as you are not heavy handed with it, you will feel no difference to the hand of the fabric. Thank you so much for posting this. I combine embroidery with applique to make fabric “paintings”. Due to carpal tunnel I have been exploring ways to add in colored pencil. I just tried layering Glossy Varnish which turned out nice but a bit stiff and I am afraid to iron it. I already have the colorless extender so this is perfect. I am so excited to have found your post! Can you sew through it after “painting” and extending or does it need to be done prior to coloring? Ginny, because this is a textile medium it does NOT change the hand of the fabric. Stitching over it leaves no visual difference over the non painted parts of the fabric. You would have to apply it thickly in order to alter the surface structure and texture. Hi. I’ve been hearing that Prismacolored pencils aren’t made as well anymore. Have you recently bought any of these pencils and tried to combine with the extender medium? I am very interested in blending on fabric. I’d be glad to hear about your most recent experiments with this method. Have you tried this with watercolor pencils or inktense pencils? Thanks for the info! Is this a “textile medium”? Assume you are using on cotton? Yes, Jacquard makes textile products so it would be a fabric medium. Yes, They are more intense (intense are INK) and much harder to control. It just depends on your application and results you are looking for. I like regular prismas because I can control flow & intensity easily. Hello, I loved your tutorial, I have a question, the prismacolor premier are based on wax. Would other wax-based pencils be used? Marco Renoir pencils? Another doubt, would another textile medium to fix the pencil? Sorry for my English, I’m Spanish and I’m using the Google translator. The textile medium Jacquard you name in Spain is very difficult to obtain. Thank you. Lia, can you get it through Amazon?